Autumn Leaves Canoe Yawl 18' 5" 1500 lbs. 60 in. 2200 lbs. 8" 37" 187 sq ft. The Humber Yawl Club was created in 1883 by canoe enthusiasts who wanted to cruise the rugged estuaries of Britain's east coast. The club oversaw the evolution of a uniquely elegant and capable class of pocket-cruising sailboats, led by legendary designers and club members such as George Holmes and Albert Strange. Few of these boats were canoes and most were not yawls, but the term "canoe yawl" became attached to these lovely designs. Designer John C. Harris has been a lifelong admirer of the canoe yawl. "To me, a 'canoe yawl' isn't just a design type; it's a self-contained small boat cruising philosophy. According to this philosophy, skilled boatmen (and women) move their little boats along the coastline in all weather, artfully playing wind and tide to make passages without resorting to engines," he writes in his article about Autumn Leaves. The attributes of a good canoe yawl include excellent sailing qualities on all points, the ability to make coastal passages in safety, snug but comfortable accommodations, and shoal draft. All of the best examples are engineless, instead relying on sailing efficiency and auxiliary oars to make the next anchorage. The chapter on Rozinante in L. Francis Herreshoff's book "The Compleat Cruiser" is probably the most persuasive case ever made for cruising in engineless boats like this. The best-known canoe yawls, such as Albert Strange's Wenda, George Holmes's Eel, and Herreshoff's Rozinante, have something else in common besides a design philosophy: they are all really, really, really hard for amateurs to build, or impossibly expensive to have built. 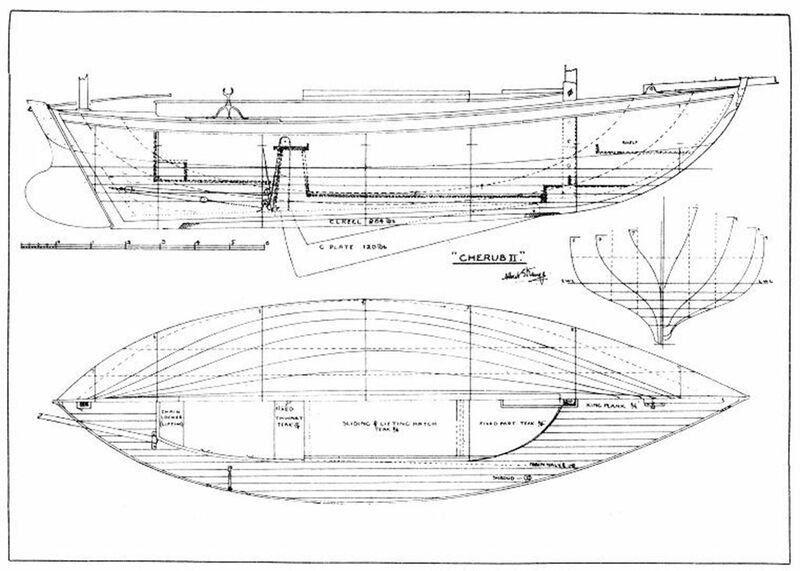 John Harris's hero Philip C. Bolger was attracted to the canoe yawl ethos and created a number of accessible modern designs, meant to be easier to build and/or more affordable. Dovekie, Birdwatcher, and Anhinga are some examples. These are engineless double-enders, with modest accommodations, that can be propelled by sail or oar. Harris has composed his own riff on the theme, Autumn Leaves. The editors of WoodenBoat Magazine found the design interesting enough to publish in the March/April 2016 issue, generating quite a bit of interest in the concept. Autumn Leaves is intended to be straightforward and cost-effective for amateur construction, capable of coastal cruising, and handy enough under sail that an engine is not missed. She measures 18'5" long, 60" wide, draws just 8" with the twin bilgeboards up, and weighs about 1500lbs on the trailer. She'll be easy to tow behind medium-sized cars. 525 pounds of lead beneath the floorboards of Autumn Leaves keeps the easily-driven hull upright and will help her carry momentum in tacking. Even in very light air, this double-ender can coast from puff to puff in a way that will help keep the oars stowed. A thousand pounds worth of foam flotation beneath the cockpit, beneath the forward end of the berth, and outboard of the bilge board trunks more than offsets the lead ballast in the unlikely event of a swamping. The cabin is small, as with all of the famous canoe yawls. It's unusually ergonomic, however, and a vast improvement over Albert Strange's Cherub II and that ilk. There's a palatial single berth. The aft end of the berth flips up to create a luxurious "throne" for the singlehander. All cooking, eating, and contemplation may be done from this plush chair. Someone used to traveling light could make themselves at home for weeks at a time. 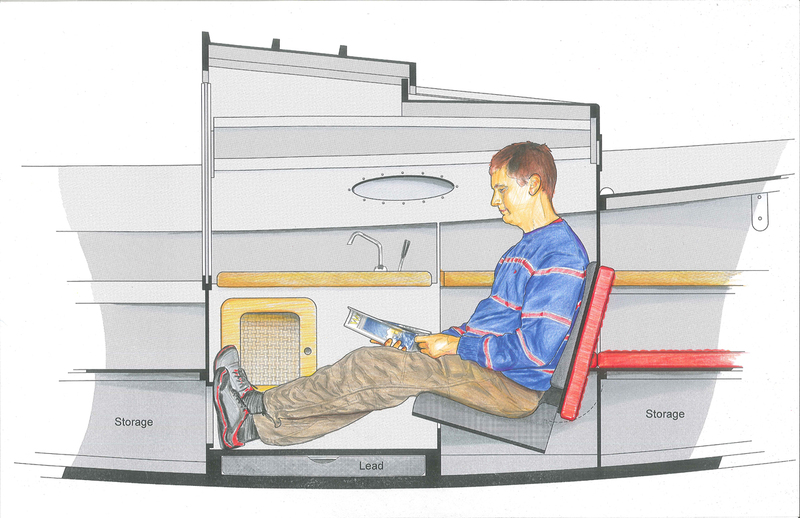 The cabin could probably be rearranged to accommodate two adults, but the boat was designed primarily for singlehanders. 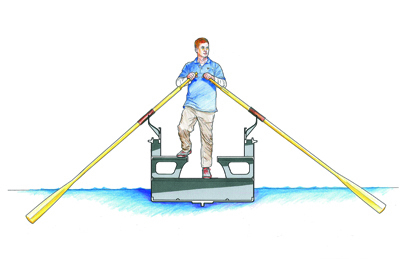 The small self-bailing cockpit is proportioned to allow the skipper to row the boat standing up and facing forward. Builders undertaking Autumn Leaves should be comfortable reading traditional boat plans, and have at their disposal stationary tools such as a tablesaw and a bandsaw. The neatly proportioned coach roof, hatches, and cockpit will require a bit of patient boat carpentry. Construction of a scale model would be a great way to get acquainted with the design. Plans consist of 17 detailed pages, sized to be printed on 11" x 17" paper. This is a speculative design. A prototype has yet to be launched. CNC-cut kits comprising all of the plywood parts are available. As of October 2018, we know of four examples under construction in the US, three of them from kits.